Bachelor of Design (B.Des.) in Fashion Communication is a 4 year full time undergraduate course, the eligibility for which is a minimum of 50% marks in Higher Secondary Certificate (10+2) examination from a recognized board in the country. The programme is spread over 4 years, divided into 8 semesters of six months each. The cut-off marks for application in this course varies from institute to institute. In various recognized universities, there are entrance tests held followed by an interview, besides taking the 12th marks into consideration, to judge the eligibility of the candidate seeking admission. Such graduates may be hired as Promotion and merchandising officers, Fashion assistants, Fashion advisers, Fashion stylists, Teachers or lecturers, Fashion designers, Fashion journalists, Sales executives, Fashion consultants, area operations managers, etc. The average full time fee charged for the course in India ranges between INR 0.79 lakhs to 7.13 lakhs, and the average salary offered to such professionals is 3.58 lakhs per annum, increasing with experience and expertise. Eligibility A minimum of 50% marks in HSC (10+2) examination in any stream from a recognized board in India. The cut-off marks for application in this course varies from institute to institute. Admission Process In various recognized universities, there are entrance tests held followed by an interview, besides taking the 12th marks into consideration, to judge the eligibility of the candidate seeking admission. Top Recruiting Companies Retail agencies, journals and newspapers, fashion designing agencies, corporate merchandisers, etc. Job Positions Promotion and merchandising officers, Fashion assistants, Fashion advisers, Fashion stylists, Teachers or lecturers, Fashion designers, Fashion journalists, Sales executives, Fashion consultants, area operations managers, etc. B.Des. in Fashion Communication: What is it about? The program has been designed to offer the eligible students a course that concentrates on the nuances of fashion designing. The first year, like with any other course, is a foundation course where students can explore themselves and begin to understand what it is like to be a designer, and inculcate the right mind-set for the same. The process of introduction and orientation with fashion communication is spread over 2 semesters, with subjects like Fashion studies, history and philosophy of design, communication concepts and processes, writing skills, consumer behaviour in fashion, computer applications, graphic design, visual merchandising, photography, and design methodology. This culminates in an integrated term project where students are able to use the software and tools actually used in the industry at the time in order to create their projects. The fifth and sixth semesters is when specialisations come in and there is a greater focus on the core of the course with creative input as well as output. A greater cognition of specialised subjects is gained through a further study of contextual subjects, attending various seminars, and of course through the design projects. During this time students also have to equip themselves with the skills of client interaction, presentation, project management, and finances, in order to turn their design skills into profitable business or acquire high paying job in already established companies. In order to sustain in this field, working well with people is of paramount importance, irrespective of whether you’re looking to start your own business or join an existing one. In the case of the former people skills will really dictate how you are able to establish and grow your business in the already competitive fashion industry, while in the case of the latter, understanding the client’s vision and working with your design team will directly affect the quality of your work and the satisfaction of your client. After having completed your bachelors’ degree, one can opt for a masters’ degree, or enter the professional sector immediately. Candidates wishing to apply for the course need to have passed their Higher Secondary Certificate with a minimum of 50% marks in any stream, from a recognized board. After application, some colleges/institutes may hold an entrance test followed by an interview to judge the eligibility of the candidate for the course. Semester 1 and 2 are a foundation course with an orientation to all subjects to be dealt with over the course of four years. B.Des. in Fashion Communication: Who should opt? The course is best suited for those who are interested in seeking a career in the fashion industry, but are more focussed on the making of trends as opposed to wearing them. Those with a creative set of mind and a fashion sensibility, with a desire to create their own, are best suited for this course. This is also a great course for those who intend to write about fashion, since it allows you to get an in-depth understanding into what essentially makes fashion what it was, what it is, and what it will be. Those who are inclined towards research and are capable of multitasking and operating at maximum productivity, and see fashion for both the business and the art which it is, are best suited for this course. This course caters to the students who seek a career in the fashion and lifestyle industry. 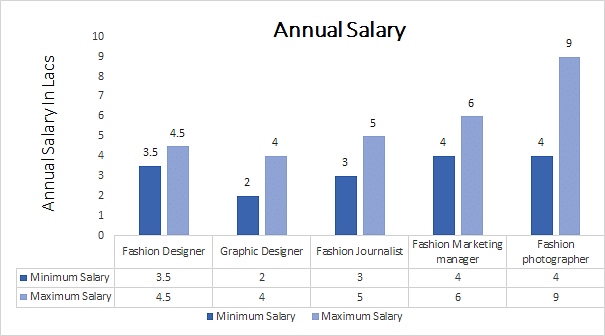 Fashion Communications graduates have various opportunities for work in marketing, advertising, public relations, journalism, and of course fashion designing. As they are required to work with the brand images of clients in most cases, and either have to manage or be part of a team, skills and effective communication are of paramount importance. Translating the client’s needs into concrete designs and executing them with efficiency, requires a lot of patience, and a lot of reliance on your team, and in the case of managers, effective delegation of work. Graduates must also be skilled in multi-tasking since they would be required to work on several projects at once, and essentially be creative on demand and within a definite time span! Such graduates may work as Fashion designers, Graphic designer, Fashion journalist, Fashion Marketing Manager, Fashion photographer, Fashion assistant, Fashion Advertiser, Fashion Stylist, a teacher or lecturer, sales executive, fashion consultant, area operations managers, etc. They may work in Media houses, Advertising Companies, Colleges/Universities, Retailing Companies, Consultancies, etc. or become entrepreneurs.